This division of Persian cats is what charmed me into the show ring. Their magnificent black tipped fur with white undercoats and distinctive eyeliner captured my attention and heart. They are the only division within the Persian breed to have the most pronounced “permanent makeup” which makes them so unique and stunning. Their sweet and loyal character only adds to their beauty and compliments their elegance. Although with five children in the house, our companions truly stand out and can be found in our laps, on our beds, or napping close by. Chinchilla silver Hiba on the left, lightly shaded silver Bella on the right. The silver Persian cat is not really silver per say, but an almost white cat with black “tipping” on the ends of the fur which gives them a sparkling silver appearance, they are said to be the most ethereal of all Persians. Depending on the degree of tipping or shading, the silver Persian cat can be a chinchilla silver Persian, which has virtually no visible tipping and almost looks pure white, or a shaded silver Persian, which has gorgeous visible tipping that gives them a lovely dark mantle (usually down the back and tail). This degree of shading, in the shaded silver Persian cat, varies in different lines. It may be a lightly noticeable mantle to an extremely pronounced one and sometimes even appearing as tabby marks. The silver Persian cat has a wide-open, sweet expression with large round green or blue-green eyes enhanced with black liner. Silver Persian cats are born darker and begin to lighten up every week after birth, in fact their final coat color may not be apparent until two years of age! Their eye color starts off blue like all newborn kittens, and may remain blue until 4 months of age or longer, when they begin turning green. 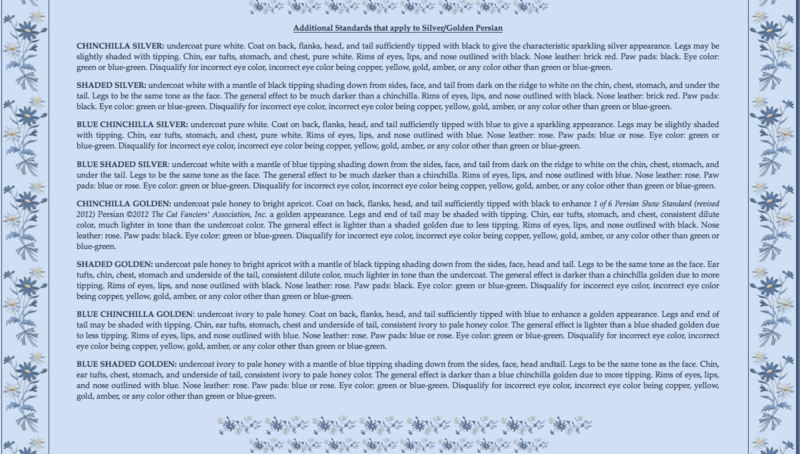 It is believed (in some lines) that the longer a silver kitten’s eyes stay blue is a good indicator that she will have a more rich/deep green or bluish-green eye color as an adult. 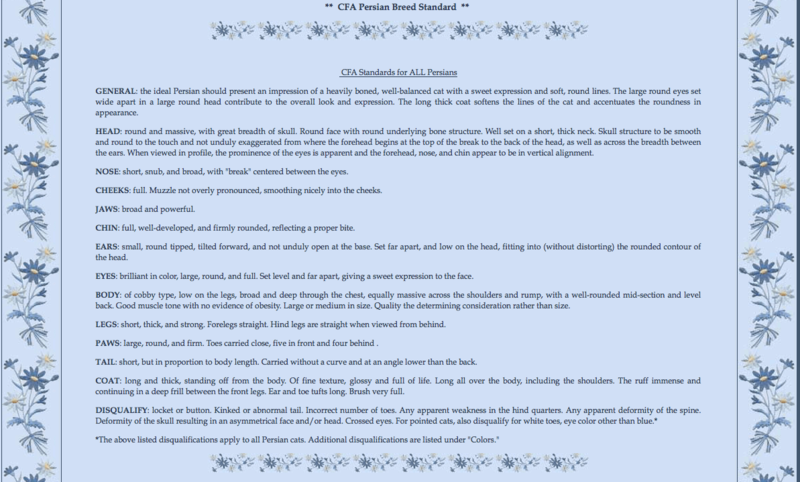 To learn more about the breed profile and breed standard for the silver Persian cat, please visit the CFA website, where they have an extensive amount of articles and pages.